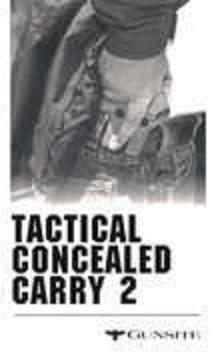 Armed professionals who carry firearms on a daily basis know there is no substitute for expert training. And when it comes to expert training, there is no substitute for Gunsite. The newest video from the famed training academy, Gunsite Tactical Concealed Carry 2 is a comprehensive look at the advanced concepts of responsible and professional firearms carry. Shot on location at Gunsite’s state-of-the-art facility, this video addresses selection of concealed carry handguns, holster types, carry styles and positions, and proper methods of draw and presentation. Through the use of realistic dramatized scenarios, it also illustrates the importance of proper mind-set, use of cover and practical carry tactics. Videos are nonreturnable; defective tapes will be replaced. Color, approximately 35 min., VHS (U.S. format) only.